5.2.5 Treaties and political and commercial agreements; arbitration, etc. 6.1.1 Dedications and foundations of temples, etc. 6.2.3 Records of buildings, etc. Some kind of punctuation is often found in inscriptions of all kinds. 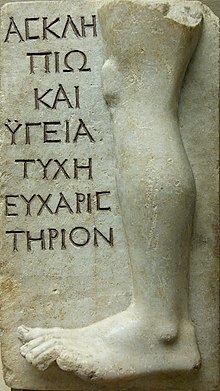 In Greek inscriptions a vertical line or a dot, or dots, sometimes indicates the separation between sentences or words, but words are seldom separated by spaces as in modern printing, so that the text is continuous and no division of words exists.This is particularly the case with Greek inscriptions of the best period. 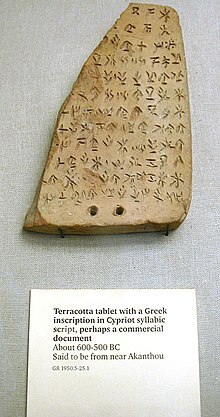 In Roman inscriptions it was usual to separate the words by dots. In certain inscriptions a cross ( ) was used to indicate the beginning of an inscription, especially when its direction was erratic. Christian inscriptions sometimes begin with a cross, which doubtless had a symbolic meaning; and a leaf or other device was often placed at the end. Treaties and political and commercial agreements; arbitration, etc. Dedications and foundations of temples, etc.